Photo courtesy of Robert Egger. When it comes to food, Robert Egger is all in favor of making the most of what you’ve got. Twenty-five years ago, Egger founded D.C. Central Kitchen, a “community kitchen” that uses salvaged food to make meals for agencies servicing low-income and homeless individuals and provides culinary training to unemployed men and women. Egger stepped down as its president last year to start a new project called L.A. Kitchen, based in his hometown of Los Angeles. Similar in concept to the D.C. nonprofit, the new kitchen places a greater emphasis on participating in the local food economy. Egger sees the effort as “taking charity up a notch” and establishing “a self-sustaining model” that supports local farmers, helps local residents and provides opportunities for men and women who may face barriers to employment. L.A. Kitchen is made up of several interrelated parts: a food collection service and processing hub, a culinary training center, a distribution service, an intergenerational volunteer program and a social enterprise called Strong Food that will compete for service contracts, particularly those catering to older Californians. Opening later this year, L.A. Kitchen will operate out of a 20,000-square-foot facility located on the premises of L.A. Prep, a food business incubator in the city’s Lincoln Heights neighborhood. Once it gets off the ground, it will run year-round, seven days a week, sustained by a staff of over 100 people and thousands of volunteers. For now, the kitchen is already operating a pilot program with its partner organization, St. Vincent Meals on Wheels. As with D.C. Central Kitchen, salvaged food is at the heart of the new project. About 30 to 40 percent of the U.S. food supply is never eaten and ends up being thrown away, according to a recent estimate by the EPA and USDA. Whereas the D.C. nonprofit recycles leftovers from hospitality businesses like hotels and restaurants, the Los Angeles kitchen will rely on donated food from area wholesale suppliers and purchase fruit and vegetables from small and mid-sized local farmers. Once produce is procured, it will go to L.A. Kitchen’s facility, which will be licensed as a USDA-certified food hub. There it will be made into edible products or processed and stored for later use. Many of the folks doing the cooking and food prep work will be enrolled in a culinary training program consisting of youth aging out of the foster care system and older men and women returning from prison. They’ll receive 15 weeks of teaching from a certified culinary instructor, intern with local industry professionals and get certificates and continued support after graduation. 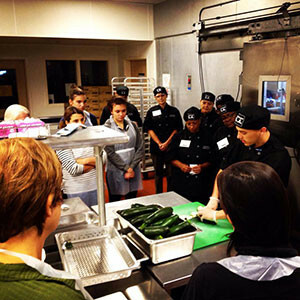 Food at the kitchen and processing hub will also be prepared by Angelenos involved in L.A. Kitchen’s intergenerational volunteer program. Meals from the kitchen will go to agencies involved with L.A.’s aging population as well as services like after-school programs, addiction treatment centers and homeless care providers. Perhaps the most intriguing element of the project is a for-profit social enterprise called Strong Food, which will be staffed by graduates of the training program. Strong Food will make meals and wholesale and retail products like snacks, juices and salad bar ingredients for both for-profit and nonprofit customers. Money earned from the venture will help support the kitchen and go towards employee retirement accounts via a profit-sharing program. Egger believes the multi-faceted project has an intrinsic link to the goals of sustainable agriculture, because of its focus on waste reduction and efficient use of resources and its focus on working with the local foods system. Ultimately he wants to see the kitchen integrate itself into the lives of local residents and entrepreneurs on a whole slew of levels, everything from supporting local farmers and community gardeners to selling products at neighborhood corner stores.